Aim: To help you find a healthy and sustainable balance between work and leisure. 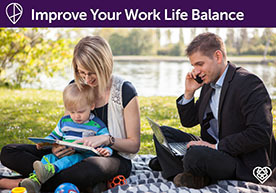 Explore tools and techniques to manage your work life balance, allowing you to be more effective, productive and engaged in all areas of your life. Anyone who feels their wellbeing would benefit from a better balance between work and home. This workshop was devised especially for LionHeart by Kate Taylor FRICS, an experienced APC trainer and assessor, and is delivered by trainers who have first-hand experience of the surveying industry. Our workshops are free but we are very grateful to those who pay a suggested donation of up to £20 to attend. On average, it costs us £50 a head to offer this service to RICS professionals, so any donations help us to cover these costs! We also run a bite-sized version of this workshop as part of our lunchtime webinar series. Please check our webinars page for details!